Monday: Saskatoon McNally Robinson. My principal and I took 3 student-contest winners for lunch at Prairie Ink and to buy a book. As I rounded the top of the spiral staircase and stepped into the Children’s / YA department, I saw it. Something I have dreamed about for many years. 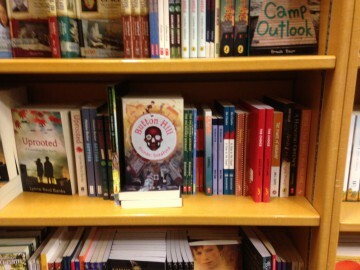 There on the McNally Robinson bookshelf was the book I wrote – Button Hill – just a few feet away from the Roald Dahl section. I stood there for a moment, taking it all in. Then the grade 4 boy we brought with us run up to me and said, “Hey Mr. Bradford what are you looking at oh look at that it’s your book I gotta go tell my sister!” He zipped around the corner, and in moments was back, his sister in tow. Thank you College Park School students for making this day unforgettable. And thank you to everyone who has supported me and offered kind words of encouragement as I have gone through the writing and publishing process. I’ll be doing some readings and book launch thingies in the weeks to come, and will keep you posted. Button Hill – first day at McNally Robinson in Saskatoon – only 3 feet from Roald Dahl!